Having made that casting investment gave Rega a “leg up” (or an arm up) against the competition and it served them well for years and still does today. In the mid-nineties vinyl started its serious fade but so confident was Rega that it built a new 30,000 square foot factory and expanded its product line to include a full line of electronics including CD players amplifiers and loudspeakers, but the company always kept turntables in the lineup and not as an afterthought or as an exercise in nostalgia. Research and development continued, though the company has long stuck to its core beliefs in tone arm rigidity over adjustability, and light weight over high mass. So one can look at the new Planar 3 ($945 w/o cartridge, $1145 with pre-mounted Elys 2 MM cartridge) and because it outwardly looks similar (if not identical at a quick glance) to older Rega ‘tables, wrongly conclude that it’s more of the same. In fact, other than a few carried over parts, the new Planar 3 is a brand new design, starting with the new RB330 tone arm, which was developed using 3D CAD/CAM technology that provided previously unavailable answers for where mass should be distributed, resonances decreased and stiffness and strength increased. The newly developed vertical bearing housing ups the stiffness while lowering the mass. The updated tracking force adjusting spring housing allows for more precise adjustability down to .1gram without using an external gauge. There are new vertical and horizontal bearings and a new 100 gram milled steel counterweight. The new magnet-based anti-skating housing simplifies the adjustment. Finally, there’s a new low capacitance Rega-manufactured wiring harness fitted with Neutrik plugs and a new locking arm holder for the 227mm effective length arm. A revised plinth of a higher grade MDF than previously used is now finished with a high-pressure bonded high gloss acrylic skin on top, under which is a phenolic brace, and on bottom a thicker 3mm phenolic brace, thus producing a rigid sandwich. The twin phase 24V motor’s performance has been improved with a new motor controller printed circuit board that allows greater assembly accuracy and is said to eliminate potential on-board component damage. Santoprene (a thermo-plastic elastomer) feet are wider in diameter and lighter than previous feet, which is claimed to improve stability and provide greater isolation. The platter is of a new Optiwhite glass material that can be more accurately machined and also looks better. Rega claims it aids in “pure gyroscopic operation of the platter, hub and bearing assembly”, which the company claims also lowers noise and increases speed accuracy. The platter rides on a new hub and main bearing assembly. The new “compression-free” bearing housing is a patent-pending design that ensure perfect perpendicularity to the plinth and optimal torque. The hub itself (the sub-platter) has been completely re-designed using Makrolon, a new high-strength, glass impregnated polycarbonate that’s stronger, lighter and more easily machined than was the previous material. The new hub also has more platter contact points, which means it better mates with the platter. The new assembly is said to stop potential energy transfer from the platter/hub into the plinth and so “dramatically” lower noise and increase detail resolution. In other words, other than the motor, the dust cover and the felt mat, the Planar 3 is a completely new design, based upon tried-and-true previous designs and proven technology. Rega offers a $59 “Ref” belt upgrade and a $395 TT PSU outboard power supply upgrade, the latter of which is standard on the far more expensive RP6. Along with claimed better speed control, it allows you to change speed at the push of a button rather than removing the platter and changing belt position on the stepped pulley. I ran the ‘table exclusively with the upgraded belt and listened and measured using both the basic “walwart” power supply and the TT PSU. When someone asks me about a starter turntable prices at “around a grand”, the Rega with Elys MM cartridge pre-installed comes immediately to mind. First of all it’s among the easiest ‘tables to set up out of the box: place on a level surface, run the belt around the pulley and sub-platter, rest the platter with felt mat on the sub-platter and then put the counterweight on the arm stub and twist until the arm balances. Add the VTF using the spring-based adjuster and then the anti-skate setting to match tracking force and after plugging in the power supply and signal cables, you’re ready to go. Takes but a few minutes. The Planar 3’s rendering of this “live in the living room” record (with the $295 Elys MM cartridge) demonstrated the ‘tables rhythmic punch and solid bass performance. No, it didn’t “plumb the depths” but the bass that was there, was reasonably well-developed and started and stopped more quickly than I remember from the previous iteration of the Rega 3. There was less “plinth induced overhang”, which also produced a finely rendered, three-dimensional “Elvis in the room”. Tapping with the stylus in the groove of a non-turning platter demonstrated a far stiffer and better braced, less lively plinth than the previous generation, which sounded more like tapping on a window pain. I played a mono copy of Bossa Nova Pelos Passaros (Riverside RM436) which on many tracks features the guitarist with his trio of Keter Betts on bass and Bill Reichenbach on drums—the same core group that played on the groundbreaking Jazz Samba released on Verve the same year (1962). The ‘table’s (or the ‘table’s and cartridge’s) performance on this record was especially impressive in articulating the guitar’s warm sound without it getting lost in the bass, which remained well-articulated and impressively solid. The overall sound of the ‘table with supplied cartridge and “Wal-wart” power supply was warm in the mids, but less than fully clarified on top. After spending a day listening to the “basic” ‘table and cartridge, I plugged in the $395 TT PSU and again played the Charlie Byrd album, which I thought would be a good indicator of what the power supply might or might not do (though I also measured). The difference was not subtle! Byrd’s guitar was more cleanly delineated in the mono space, and his string plucks were better articulated. The soft snare hits were so better clarified and focused in space and the bass, which already was quite good, was even better articulated. Overall what had been a very pleasant, warmish but reasonably well articulated mush, became a far more clarified picture in every way. A few tracks on the Byrd album include a trombone, flute and alto sax. These all congealed with the ‘table plugged in via the Walwart. With the TT PSU power supply the instruments separated in space and were noticeably better articulated. Perhaps if you are buying this ‘table you should just go the extra $395 when you do, though an argument could be made for living with it for a while to hear if you wish to further invest in it or go upmarket. My opinion is that you give up so much by powering the Planar 3 with the Walwart, it makes sense to start with the TT PSU if at all financially possible. The differences were not subtle on every record I played. How much of what I heard was the ‘table and how much was the cartridge? It’s difficult to separate the two without changing cartridges. While the sound with the Elys2 was what about I’d expect from a $295 cartridge—more midrange and less resolving on top, with slightly boxy low frequencies— I wanted to hear how the ‘table responded to one costing far more. I chose the $1495 Audio-Technica AT 150ANV, which costs a bit more than the ‘table with upgraded power supply ($1549). This is a really superb, high-tech MM cartridge featuring a sapphire cantilever to which is attached a Micro-Linear shaped stylus. In the blind test we conducted with you, it got the most votes. You could say that was overkill but what it told me was that the Planar 3 can really sing with a better cartridge than the Elys2. The top end in particular was vastly improved not only in extension, but especially in resolution and a less “mechanical” quality that resulted in a velvety smooth sound plus greater overall resolution—I’m not sure the older 3 would have been able to appreciate and deliver all of this resolution particularly at the lower end of the dynamic scale. And the bottom end had more “sock” and slam that the ‘table handled very well. When I played Kansas City Suite-Count Basie & His Orch. The Music of Benny Carter(Pure Pleasure/Roulette PPAN SR52056) recorded at United in Los Angeles, Eddle Jones’s monumental bass was more powerful and well articulated than I’d been expecting and the overall dynamic swagger was equally impressive. However, the top end was muffled and everything was distant. Then I played the version of the same song on the Mosaic LP box set The Complete Roulette Studio Recordings of Count Basie And His Orchestra (Mosaic MQ15-149) and even though it was a compilation the orchestra brass was so much more open and appropriately brash. Lately, Pure Pleasure has put out some really questionable sounding releases like this one. However, given the right recordings, the Planar P3 (especially with the super-expensive cartridge) sounds far more accomplished than its price tag would lead one to believe it can perform. I also played a just reissued by Analogue Productions version of Winds of War and Peace (APC 8823) originally issued by Wilson Audio in 1988 and engineered by Wilson Audio Specialties’ Dave Wilson. It’s a recording of the National Symphonic Winds, which I believe is a military outfit. The conductor Lowell Graham spoke about the recording at an audio show a few years ago, explaining that the enormous bass “thwacks” were produced by a large, floor standing drum hit with what he called “The Mallet of Death”. When I played a high rez rip of this track at a Consumer Electronics Show a few years ago, the “thwack” literally vaporized a speaker’s ceramic midrange driver! I played the reissue on the Planar 3 (with the Audio Technica cartridge) wondering how it would reproduce that big bass hit and I was rewarded with an impressively deep, solid and strong “thwack” that I don’t think the older 3 could have managed (though admittedly without actually hearing it that’s pure conjecture). 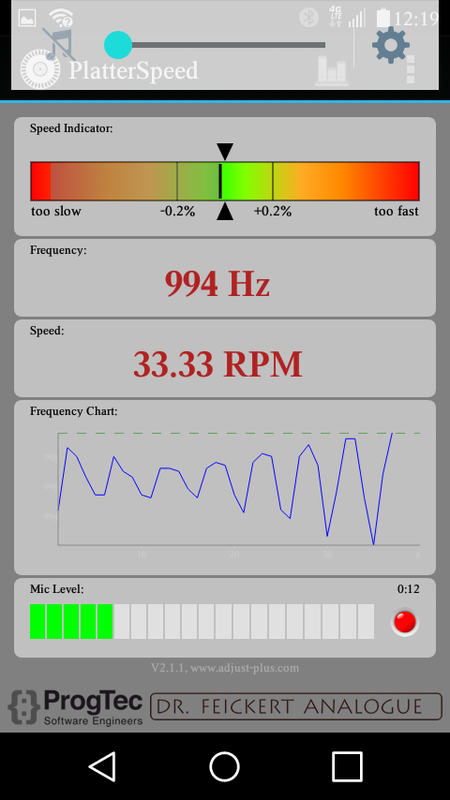 The test tone is at 3150Hz, which is not even visible in the graph because the turntable spins more than .2% fast. I had been expecting that because Rega runs their ‘tables fast. They might deny it, but every one I’ve reviewed has run slightly fast. The low pass filtered green line shows the 3150Hz tone reproduced at approximately 3175Hz. The yellow shows the raw frequency performance that also includes eccentricity caused “wow”. The second image shows you mean frequency of 3175.3, wow of ± 0.17% and 0.13%. Low pass filtered, the maximum relative frequency deviation was ±0.03 while the absolute deviation was -1.0%/+1.1Hz. The relative consistency of the green line is impressive and rivals the performance of some far more expensive 'tables I've reviewed. You’ll note that with the PSU, the ‘table ran slightly faster but also that the green line is smoother and flatter, demonstrating the PSU’s effectiveness. Also note that while the “Wow” and raw Frequency measurements were not all that different, the low pass filtered maximum deviations both relative and absolute were better. In fact, the absolute deviation from speed was halved via the PSU. More importantly you can easily hear the difference. So what does it mean that the turntable runs slightly more than .2% fast in terms of what you hear? So yes, a 3150Hz tone is reproduced with a mean frequency of 3175.3 Hz (or 3177.2 Hz) but what if any are the sonic consequences of that? I played a 440Hz test tone (440Hz is the musician’s “yard of A” above “C” that conductors use to “tune up” the orchestra) and used a digital voltmeter with a frequency function and measured 444Hz. So how much of a sonic pitch difference does that make? Interestingly someone has posted a comparison on YouTube and you can listen for yourself. They have also posted the two tones simultaneously. But why would someone post that? If you go to the link found on that YouTube page you’ll find something so bizarre, creepy and grotesquely anti-semitic, related to 440Hz vs. 444Hz that I just had to alert you to it! Not that I think the 'table is set to run at 444Hz for a 440Hz tone for some nefarious purpose! Back to the review: the ‘table runs slightly fast but unless you have perfect pitch you’re not likely to notice it. What it probably does though, is add a subliminal dose of “toe tapping” excitement with no other harm done. Still, I prefer turntables to run at the right speed (it’s indicative of the poor state of audio reviewing that most turntable reviews don’t bother telling you if the one being reviewed runs at the right speed). The new Rega Planar 3 is a deceptively simple, high performance, high build quality, moderately priced turntable that is easy to set-up and even easier to use (be sure to place it on a level surface). It’s among the best, if not the best circa $1000 turntables currently available. It showcases what analog does best, just giving you less of what’s possible from the very best, in a well-balanced presentation that might surprise you with how well it can deliver deep, well controlled bass and rock-solid image stability. No, you cannot easily adjust VTA/SRA or azimuth but at this price point, rigidity is preferable to “loose” adjustability (Rega does manufacture shims that allow you to raise the rear of the arm to increase VTA/SRA, but there’s no way to decrease it from whatever it is “out of the box”). While buying it with the pre-installed Elys2 cartridge makes it even easier to buy, unbox, set up and use, the 3’s arm is so good you ought to consider from the start stepping up to a higher performance, more expensive cartridge if you want to hear the Planar 3’s full capabilities. One gripe: because the arm's effective length of 227mm is so unusual, you are limited to either the paper overhang gauge supplied with the 'table (Rega doesn't specify the geometry used, but previous ones were for Stephenson, which I regard as the least useful for popular music in terms of the distortion curve—and it's not that much better for classical music IMO) or to a "universal" gauge like the Feickert, which, in order to get an accurate setting, requires you to carefully set the pivot to spindle distance. Unfortunately Rega arms do not mark at the top of the arm, the location of the horizontal pivot, which makes difficult using such a gauge. The Planar 3’s combination of easy set-up, high build quality, reasonable price and attractive sonic performance make it easy to recommend in the $1000 price point. The $59 Ref belt and especially the $395 TT PSU seriously upgrade the 3’s sonics and are highly recommended. My first post-CD era table was a Rega P5/Rega Exact, then upgraded to a P7/Dynavector DV20X-H, then to a P9/Lyra Delos. All three of the table were excellent spinners. They are simple, yet elegant and do what they are designed to do, provide musical therapy to those of us who struggle through the day. My current table is a VPI Aries 3/Ortofon Cadenza Black but could have easily been more than satisfied with a RP10/Apheta. My congrats to Rega for staying the course during the days of booming CD sales. BTW, I use Rega products for my office system; they do Integrated amps, DACs,a nd CD players pretty well, too. first, I always thought that my Rega P5 (and my original P3) ran about 2% fast. but from 440 to 444 hz is 1%....not surprising, same for 3150 to 3175...Is it 1% or 2% fast? Second, I would like to buy a power supply that has a pitch so I can get it "right". my first thought is the Phoenix Eagle which you were quite impressed with (if I remember correctly). What will work (well) and plug in properly? do you know? OR...if I buy a new subplatter, who makes one that is "2% larger"? Michael Lim makes a larger, all-metal subplatter as an option. What is "Lim"? If it's larger subplatter, the 'table will run at the wrong speed so I don't understand! Michael Lim is a retired engineer based out of Malaysia. He sells aftermarket Rega modifications that can be retrofitted to older Rega turntables. These include CNC-machined metal subplatters, similar to those used on the higher-end Rega turntables. As an option, he offers a subplatter for Rega that is *fractionally* larger (maybe an extra millimeter in circumference) to slow the typically 1%-2% speed overshoot. This as opposed to running some electrical tape around the perimeter of the subplatter, an old-school way of fractionally slowing the speed. Mr. Lim also sells an acrylic platter, underhung couterweight, external motor mount, and other sundries. Other popular aftermarket Rega modifiers include Tangospinner (Argentina), Groovetracer (California - the Rolls Royce of Rega subplatters), Iso-Kinetic (UK - similar in performance to Groovetracer), and SRM-Tech (UK). I've owned a couple modded Regas. Having owned a VPI Scout SE and Pro-Ject RPM 10.1 Evo, I can say a few intelligent modifications help an entry-level Rega close the gap on pricier offerings. It allows hobbyists to make incremental improvements if they are not in a position to buy a better turntable outright. Some hobbyists go all-out with pricier options like the Audiomods tonearm, and end up spending as much or more on a fully tricked-out P3/RP3, P25, P5/RP6 than the RP8, P9, or RP10 might cost. There is also the groovetracer subplatter. http://www.groovetracer.com/subplatter_groovetracer.htm and yes I noticed a difference in speed being slower using the subplatter. The stock rega subplatter actually was very close to accurate speed while the groovetracer slows the speed down. This is all on my P3-24. Eventually you stop tweaking and just listen to records. Being 'mathlexic' I didn't calculate percentages but the Platterspeed app indicated the speed was "off the chart' beyond 2%. Yet if your calculations are correct perhaps the app's indicator needle is a rough, not accurate pointer. I don't believe the 24V motor can be controlled by the Phoenix, which is for a 110V A.C. Synchronous motor. Sorry, it should have read .2% fast..... anyone extrapolating from the Platterspeed app numbers would have caught that. I don't have a copy editor so there was no safety net! My apologies to all. Hi Michael, thanks for another very thorough and fair review. To minimize typing and viewing errors for numbers with decimals, I strongly suggest you use the engineering safety practice of always placing a zero in front of the decimal point for any number less than one. So .2% becomes 0.2%. This might not have aided your most recent effort, but it will certainly help in the future. Decimal points are very small for aging eyes like ours; this practice helps immeasurably. P.S. I would really like to know your impression of the Project RPM5 Carbon. Can a Rega be run with the Phoenix Engineering products? The Falcon and Roadrunner would put it even closer in price to the RP6, but might yield the correct speed! Given how the price gap narrows, a question on many a Rega user's mind is a comparison of the new Planar 3 (or even the outgoing RP3) with Power Supply versus the RP6. It raises questions like whether to buy the Planar 3 with Power Supply and a better cartridge or the RP6 with a lesser cartridge. Of course, I realize you have much on your plate, and cannot review everything... Nor does Rega send you everything (i.e., RP10). In the aftermarket, in contrast to Rega's stiffer white belt, a lot of Rega owners choose a more rubbery belt to achieve correct speed. This might be thought to introduce other problems, like belt slippage, but people report good results, perhaps because Rega already rely on the inertia of a (relatively) heavy platter to help overcome things like motor cogging. At any rate, thank you for another well-considered product review that articulates the design decisions. The Phoenix Engineering Falcon and Roadrunner will work with Rega Products. The wonderful design behind them allows them to be used with any AC motor that draws under 3 amps of power, which Rega Turntables are well under. here is a photo from Groovetracer that shows it being used with a Rega RP3. I figured it should work, but hand't heard of anyone doing it yet. I purchased the new P3 with Elys a few months back and I'm very pleased with at. At the same time I added a Vincent Pho-8 to link up with a Marantz amp. My question is can I also add a TT PSU to this set-up or would it replace the Vincent? The Vincent is a phono preamplifier that brings the mV signal off the tonearm up to line-level (typically ~2V) and applies equalization (RIAA). It is connected to the turntable via the RCA jacks. The TT PSU is an external power supply that allows the Rega motor to drive the platter with greater speed stability, and also offers the convenience of speed change (33/45) with a push-button rather than having to remove the platter and change steps on the motor pulley. It is connected to the turntable via a 5-pin DIN. So no, the TT PSU does not replace the Vincent. ... maybe you could arrange to try it with a Music Hall Cruise Control (which costs $300 and allows fine speed adjustment) to see how the combination performs. Can someone please explain how a turntable's power supply could possibly -- in a million years -- affect the sound? The PSU gives the motor power, which turns the platter. It is not (or should not be) connected to the output in any conceivable way. They are completely independent. Your turntable doesn't need external power to even make sound; the cartridge does all that. Unplug it spin a record by hand -- music. Well-written, informative, interesting article, no doubt. And beautiful table. I'm sure it sounds excellent. But I just can't see how a power supply is a sound upgrade. Especially for the low, low price of $395. can have an enormous effect on the sound quality of your table. A better PS will give you more speed stability (and hopefully more accuracy too) and therefore improve the sound. The fact that it isn't in the signal path doesn't have anything to do with it. Turntables hum because the cartridge picks up the magnetic fields from the power supply. Moving the power supply a foot or two away from the table makes it much quieter. With your valuable recommendations, not really a $1000 TT. "The $59 Ref belt and especially the $395 TT PSU." Really more like a $1454. At that point, wouldn't you think the VPI Scout Jr potentially get you to a better place Mike? I was thinking the same. If one lives in the US, it would make sense to buy American. Not just out of patriotism, but also I wonder if service is more easily available? Cool nonetheless that more resources are invested in improving the turntable. Is Rega's U.S. importer. They have been around a long time and have good customer service. You can easily get parts/service through them, if not your dealer. I've owned both brands, and in my experience, a VPI will sound different from a Rega. If you know and like the Rega sound, another brand of 'table, even at a (moderately) higher price point, will not necessarily realize an across-the-board improvement. Pricewise, the Scout is more comparable to the RP6. Hi Michael, many owner of former RP3's have tuned their turntable with the Groovetracer subplatter. Do you thing the new Planar 3 with the new designed Makrolon subplatter need this tuning? So the Audio-Technica AT 150ANV has gone from $995 when you did the comparison in 2013 to $1549? I guess the manufactures need to get while the getting is good because eventually they will out price people from getting into analog. ... wouldn't it make more sense instead to buy the RP6, which includes the TT PSU? Thanks for the review and the very positive conclusions. The new “Planar” series designation was chosen very deliberately reflecting the original design goals of 40 odd years ago setting a new standard of performance at realistic prices. Part of the ongoing development at Rega for the past few years has been the introduction of brand new ways of measuring & testing speed in production to achieve even great accuracy than we were getting before. This culminated in new factory equipment installed and every table tested under load ie playing a disc to ensure stability and consistency. When next in the UK Michael please let’s arrange for you to visit the factory and you can see what we are doing as always we are completely open to showing what and how we do things at Rega. In our opinion a 2% fluctuation in speed would be audible and not something that Rega would deem as acceptable after 42 years in business. or the consistent manufacturing of tables “engineered” to run at the incorrect speed. Very nice and polite way to point out Fremer's inaccuracies. Due to a typing error, the review originally had 2% fast when it should have been .2%. My apologies for that mistake. It was not deliberate and anyone extrapolating from the Platterspeed app numbers would have caught it. My apologies to all.. So why does every RP6 run at 3.7 rather than closer to 33&1/3. This must be on purpose? ..with Groovetracer acrylic platter, Audiomods tone arm and Clearaudio Maestro Ebony MkII. Even though I still drive a BMW Mikey I think I've chosen wisely.. I'm even more interested in a review of Elvis Way Down In The Jungle Room than this turntable. Though I did enjoy it's review. Thanks. I'd read that. I was just hoping Mr. Vinyl would give us his take on the album. I've got a Pro-Ject Carbon with Ortofon 2M Blue, Acryl-It platter and SpeedBox II. Am I likely to notice much of a difference? How does it compare to similarly priced models from Pro-Ject, VPI, Clearaudio, Marantz? Would an Exact2 be a better first upgrade or the TT PSU? Can the platter be used sans mat? That's already a fairly decent TT. I'd be looking more at the RP8 for a significant upgrade from that. What would be cool would be if Rega could include some speed adjustment on the TTPSU. They do on the RP10 but not on the cheaper PSU. I have an RP6 and love it, but the same app shows mine is even faster than the P3 under review! As the oboist who "tunes up" the orchestra at every rehearsal, I find that big of a variance in pitch to be unacceptable for classical listening. That would mean that american orchestras that play at A=440 would sound like they are playing at A=444, and european orchestras that play at 444 or 445 would sound closer to 450, unacceptably sharp. It would bug my ears a ton. No, I don't have perfect pitch, but when you hear the same instruments and ensembles all the time you develop incredible relative pitch, and you would be able to easily tell that something is off with the timbre of the instruments relative to the pitch. No one wants to hear weird vibrato that would naturally make itself heard because of the "ratcheting up" of the speed. Not to mention this problem excludes the option of ever playing along with my records. I understand that to most people this is very minor. I must say I've heard some incredible rega tables over the years. I was very impressed with the Rega/Harbeth room at montreal audio fest last year. But for a turntable that is supposed to be high end, this type of pitch problem is simply unacceptable to me. I'm sure a company as distinguished as rega is able to make their tables sound "exciting" without resorting to faster speeds. But if you read the reply from steve@soundorg.com just a few above yours you will see that he is the person who sent the turntable to Mr Fremer to review and before sending it checked the speed and it ran at 33.33rpm as per the photo he links to. Something is awry with either his measurement or Mr Fremers which really deserves further investigation. It certainly can't be left hanging in the air and fostering the belief that Rega turntables are designed to run fast. I have an RP6 which I like but I really would LOVE an answer from Rega and the Sound Organization just why their tables do run fast. Mine and every other RP6 owner I know has their tables running at 3.7 rather than 33&1/3. I really don't notice it much but my musician friends do. This obviously is a decision they made and not an accident. I'd love for you to ask the reasoning for this. I never needed measurements to confirm this. I am a classically trained pianist with perfect pitch. My previous version RP3 is audibly fast. The higher pitch is very easy to detect. 444hz vs 440 is very, very, very audible... especially for anyone who is required to take Ear Training as part of their music education. Those ear training programs require you to tune by ear to within a few cents. Hey Mike, did you need to shim the tonearm to run the Audio Technica cart? Also, what alignment did you wind up using for your listening tests? Thanks! Any chance you will review the RP10 at some point? I bought Planar 3 with pre installed Elys2 and its amazing. I wonder if the arm needs to be calibrated - contact angle, azimuth, overhang, etc. Another extraordinary review from you Michael. But I am having a doubt. Does it use the power supply for the sound upgrade? PSU is used to turn the platter by its motor power. Do you think its connected to any of the output? Cartridges help in making the sound, they do not need any external power as they are independent. Here is a source where you can check out various types of turntables and their reviews. It's a thing of beauty. However, I'm still not persuaded to part with my 1995 Rega Planar 2, replete with RB250 arm. I recently installed an Ortofon 2M Blue cartridge, a white belt drive and undertook a general clean up job with the help of my local hi-fi dealer. A revelation. Built for life and still sounds gorgeous. Not even the nagging sense that I can probably afford something up the chain to play through my brand new 2017 Rega Brio amp has tempted me to change. The point is, it's difficult to go wrong with a Rega. Rega 3 Compared to Rega p25? Mr. Fremer, I appreciate your frank and informative review. Please offer your opinion on how this compares to the p25 you reviewed back in '99. Used Planar 25 vs new Planar 3? thanks.